The Leo Vegas Christmas Bonus is all about free spins and this is the last Thursday that you can claim this Christmas special offer! We hope you're enjoying the holiday season and getting plenty of time to relax and play great casino games. With that said, we also need to remind you that the Leo Vegas Christmas Bonus comes to an end today so if you haven't taken advantage of this yet, be sure to visit today as this is the last Thursday to do so. This promotion has been extremely popular with players, many of whom have received up to 100 free spins on some great festive slots games. 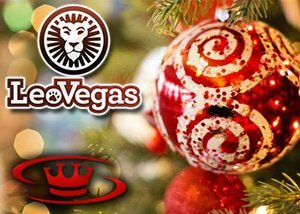 To help players get into the Christmas spirit Leo Vegas casino has been giving away 100 free spins every Thursday when you play at the LeoVegas Live blackjack or exclusive celebrity blackjack party tables. This festive event kicked off on the 8th of December and ends today (December 29) and we have all the details you need in the section below. This holiday promotion saw a special bonus card being added to every deck in the special blackjack tables and players lucky enough to get the card were given 25 free spins on great festive games. You can get up to four bonus cards for a total of 100 free spins on these festive slots games, so be sure to grab a mince pie, play those festive tunes, and head over to Leo Vegas casino to get your hands on some free slots action. Who knows, you could be heading into the New Year a little bit richer too. The free spins bonus cards promotion finishes up today and you have until midnight to get your hands on them. Just play at the LeoVegas Blackjack table and the exclusive LeoVegas Celebrity blackjack table to be in with a chance. There are three free spin bonus cards added to every shoe during each of the promotional periods and all free spins are credited to play accounts before 3pm the next day. The free spins cannot be redeemed for cash and are only for the specified games. There are more terms and conditions and these can be found on the casino website. Why not end your holidays with some free spins from Leo Vegas. You can play on all devices including mobile, tablet, and desktop and best of all, just one lucky spin could see you celebrating in style this New Year. Happy holidays to all our readers and don't forget to keep an eye out for fantastic new promotions and no deposit bonus offers for 2017.